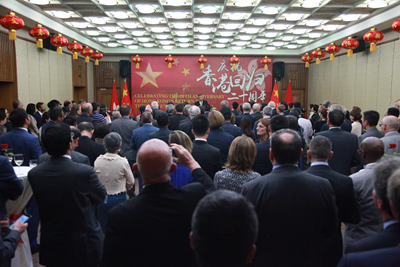 It is a real pleasure to have so many friends with us to celebrate the 20th anniversary of Hong Kong's return to China. On 1 July twenty years ago, the Governments of China and Britain held a handover ceremony to mark the return of Hong Kong. From that day on, China officially resumed the exercise of sovereignty over Hong Kong. The Hong Kong Special Administrative Region was established. Hong Kong's return to China was a landmark in China's modern history. It was a long-cherished wish coming true for generations of Chinese people, including compatriots in Hong Kong. It was a significant achievement that left its mark in the history of the Chinese nation. It was a pride for each and every Chinese to see Hong Kong's bauhinia flag side-by-side with the five-star national flag. Hong Kong's return to China is a milestone in the history of Hong Kong. After a hundred years of ups and downs, Hong Kong finally rejoined the motherland. Hong Kong people have become the masters of the land they call home. And Hong Kong has since entered into a new phase of development. 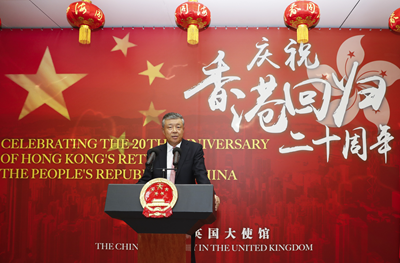 Hong Kong's return to China is also a highlight in the history of China-UK relations. The historical obstacle to closer ties between China and Britain was finally removed, sending the bilateral relations onto a fast track. In the twenty years that followed, China-UK relationship grew from comprehensive partnership to comprehensive strategic partnership, and then to a global comprehensive strategic partnership for the 21st century. Now this relationship has entered a "Golden Era". On 1 July 1997, I had the honour to attend the handover ceremony. At the emotional moment when the Chinese national flag was raised, my heart was full of pride and excitement. It was a moment simply beyond words and most unforgettable in my life. Today, when I look back at the extraordinary journey Hong Kong has traveled, I can appreciate more deeply what Hong Kong's return truly means to Hong Kong, to China and to the world. First, Hong Kong's return marks the beginning of a new journey towards the great renewal of the Chinese nation. In late 1970s, Mr. Deng Xiaoping, the courageous and insightful leader, first proposed the vision of "one country, two systems". This innovative framework was first applied to the Hong Kong question. Twenty years on, "one country, two systems" has been hugely successful in Hong Kong and Macau. This policy has shown strong vitality. It has been an enrichment to socialism with Chinese features in both theory and practice. It opens up a creative new way for the peaceful reunification of China. It heralds a new journey towards rejuvenation of the Chinese nation. It strengthens our confidence in achieving the ultimate unification of the Chinese nation. Second, Hong Kong's return marks a new phase of prosperity and development in Hong Kong. Over the past 20 years, the Central Government of China has consistently and strictly adhered to the Constitution and the Basic Law. The Chinese Government has been firmly committed to "one country, two systems", "Hong Kong people administering Hong Kong" and high degree of autonomy in Hong Kong. Hong Kong has maintained prosperity and stability. Hong Kong's GDP has doubled. Hong Kong remains a global centre of finance, shipping and trade. Hong Kong continues to be one of the freest and the most competitive economies in the world. Today, Hong Kong is the fourth biggest financial centre, the fifth largest container port and the eighth biggest trading entity in the world. Hong Kong is also making steady progress in its democratic governance. From political stability, governance efficiency and regulatory quality to the rule of law, control over corruption, right to expression and accountability, many indicators are showing Hong Kong's improvement over pre-handover years. Third, Hong Kong's return is a major innovation in terms of social and political system. "One country, two systems" is a great invention. It allows the coexistence of the socialist and capitalist systems within one country. This is unprecedented in human history. In Deng Xiaoping's words, "Has any government in the history of the world ever adopted a liberal policy like this? Has any western country in the history of capitalism ever done anything like this?" The successful practice of "one country, two systems" in Hong Kong shows that this solution proposed by China is absolutely feasible. It is a daring and successful experiment with different social systems. Fourth, Hong Kong's return sets a fine example of peaceful resolution of international disputes. The Hong Kong question had existed for 156 years. It involved highly complex historical issues and contemporary disputes. However, China and Britain opted for new ways of thinking and explored untried solutions. After ten years of peaceful negotiation, the Hong Kong question was successfully solved and Hong Kong was returned to China. Such a tremendous historical achievement is undoubtedly a result of joint efforts by China and Britain. It is an excellent example of addressing historical issues between states. It is also a contribution to world peace, development and progress. In the past twenty years since Hong Kong's return, the Chinese Central Government has given Hong Kong its strong backing. The people in Hong Kong and the mainland have worked hand in hand. Thanks to all these, Hong Kong has maintained steady and robust growth. It has built up closer ties with the motherland. It has set out to embrace a future that is brighter than ever before. However, there are still some worries in Hong Kong and in the world about the future of "one country, two systems". Some are concerned that there might be a "policy change" by the Chinese Government. I think these worries and concerns only reveal a lack of understanding of Hong Kong's reality and the Chinese Government's policy. Hong Kong has been successful in the past two decades. That means "one country, two systems" is a good policy. A good policy will not change. As President Xi Jinping said, "Whatever difficulties and challenges there are, our confidence and determination for the 'one country, two systems' policy remain unchanged, and our confidence and determination in implementing this policy remain unchanged." "One country, two systems" is an undertaking untried before. There is no precedent to follow. And there will inevitably be all sorts of problems on the way ahead. But any problems that will emerge are "growing pains". They are problems on our way forward. I believe through trial and exploration, "one country, two systems" will continue to be improved and become mature. Before its return, Hong Kong had been a historical question between China and Britain. After its return, Hong Kong became an important bridge and bond linking our two countries. As we move forward into a new era, we need to stay committed to the "one country, two systems" policy and maintain Hong Kong's prosperity and stability in the long run. We also need to enhance Hong Kong's role as a bridge linking China and the UK as we advance our bilateral ties in the "Golden Era". To achieve these goals, I think the following three points hold the key. First, we must be true to our commitment and strictly follow through "one country, two systems". and to maintain prosperity and stability in Hong Kong. "One country" is the underlying precondition for "two systems". It should never be swayed or altered. Being a member of the big family of the Chinese nation is Hong Kong's guarantee for long-term prosperity and stability. That is, we must apply "one country, two systems" comprehensively and accurately. We must always make sure that this policy is not misinterpreted or misimplemented. This is in the shared interests of China and the UK. Second, we must maintain confidence and seize the opportunities to build a better future for Hong Kong. And the grand design of Guangdong-Hong Kong-Macau Big Bay Area. These will bring new opportunities to Hong Kong. They will also create new growth in China-UK and Hong Kong-UK cooperation. All we must do is to keep up the confidence in Hong Kong's future and seize the opportunities to deepen cooperation between China and the UK and between Hong Kong and Britain. This will make sure that we will all benefit. Third, we must hold our bottom line and firmly oppose the so-called "Hong Kong independence". Hong Kong is an integral part of China. China brooks no division. There is no way out for so-called "Hong Kong independence". The British Government has made it clear on many occasions that Britain does not support "Hong Kong independence". We commend this position of the British Government. Clearly, the so-called "Hong Kong independence" will bring up nothing but harm and hazard. "Hong Kong independence" activities in whatever form must be firmly opposed. This is the bottom line that we must hold. 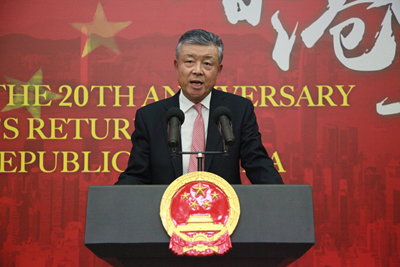 The Chinese Government supports Hong Kong's ties and cooperation with the world. However, we firmly oppose any interference in Hong Kong affairs by any foreign country under any excuse. Hong Kong has returned to China. China has sovereignty over Hong Kong. The "one country, two systems" policy must be seen in its totality. Hong Kong-related issues must be handled appropriately. I hope that by recognizing and respecting the above, we will continue to make Hong Kong a positive factor between China and Britain. By recognizing and respecting the above, we will ensure that Hong Kong will continue to contribute positive energy to the "Golden Era" of China-UK relations. "Do not let slip when the time comes. Do not let pass when opportunity knocks." I sincerely hope that people from all sectors in China and Britain will seize the opportunities before us. And we must all work hand in hand to support Hong Kong's development, to consolidate the cornerstone of Hong Kong's prosperity and stability, and to create a more promising future for Hong Kong. To a promising future of Hong Kong. To the "Golden Era" of China-UK relations.